While stepping in the main thread I notice a thread which appear to hang on RemObjects code. It could be that this is a delphi RIO debugger issue but I wanted to check with you. Could the fact that the code cannot advance to my breakpoint be related to RO code? 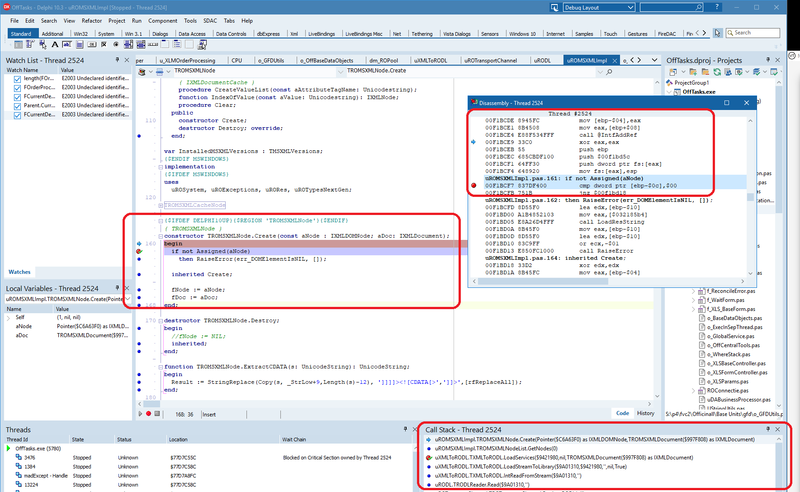 In the callstack of the screenshot you see where the code stops. The critical section (thread view) is mine and should not be the reason why the RO thread blocks. if this app is a RO server and someone requests for a RODL, this request will be processed in background thread. I don’t see whole call stack but I think, this is this case. it stops at IntfAddRef. Looks like, it tried to add reference to IXMLDocument.